It's common knowledge amongst us CaptureNX2 users that some of the tools available in CNX2 are somewhat limited .. in that they're now old hat, and are seriously due for an overhaul. CaptureNX3 doesn't appear to be coming any time soon either! But forgetting all this for now, I want to concentrate on the things it can do, and I'm not so sure that even the folks that do like CNX2 know of all it's potential. This one is about noise reduction options .. which for most purposes can be as good as some of the better NR software out there. The process steps may be a bit convoluted, but can yield significant results for 99% of users. One thing to note with the screencaps is that they are all at 100% pixel view and saved in that manner so that a better assessment can be made of how well each NR option solves a specific problem. I haven't delved into every possible option available .. only the ones that have served me well for my purposes. ANYONE is more than welcome(encouraged even!) to add to this tute if they know of an NR option in CNX that isn't listed here. Note that the image I'm using for this tute is one from Imaging Resource. The actual image used was the still life ISO6400 with NR set to OFF(what they call NR0). I regularly use this site to download and compare images for comparsion purposes .. in many instances a raw file is available for download. Something to note: in this screen shot, even tho NR in camera is set to OFF, when opened in CNX2 there is NR enabled in the Camera Settings tools. This NR setting is very coarse having been set to Faster, which points to a plausible explanation that it is in fact a camera setting, not a software setting! If in camera NR is set to OFF on lower ISO images(say ISO1600) .. CNX2 doesn't add NR in any way. It's a commonly held belief that there is some form of in camera NR going on even if NR is set to OFF, when higher ISOs are set. I just can't remember exactly at which ISO setting this takes effect. Anyhow, by the looks of things, it appears that this NR setting can be turned off via CNX2. With one of the CNX2 incremental updates, they added an option for this Astro Noise reduction ability. Then after this again, they also added another NR option update which took the two settings of Faster and Better Quality, to a third option of Better Quality 2012. Either way, hopefully this Better Quality 2012 option is available for you .. as it does have some advantages over the old Better Quality option. Another point of notewortiness: the Faster option is all but useless! First thing to note between the image with the NR setting and this one is that noise is an immediate and obvious obstruction(at 100% view) .. but I don't know for sure if disabling the NR in this manner gives an actual zero NR from in camera raw file. This is apparently important in astro images for those that specialise in it. For us non astro types, the increase in noise is obvious .. so I reckon that removing the NR setting may in fact give you a non NR tarnished raw file as a result. I generally don't use this option. Also of note is that as ISO levels increase in camera the NR settings in this tab in CNX2 also increase to counter the extra noise .. but can all be undone with the click of that disabling arrow(shown in the screen shot). Next post will concentrate on the other options for NR via CNX2. In the Camera Settings tool is the easy way to set NR, and this is what you should see as options available. The Better Quality 2012 option is definitely better than the other two, even tho I used a 50% Intensity level .. in normal use you wouldn't. I just set it this way to highlight the difference in the options and to highlight the effect of NR .. that is lost or mushy detail rendering. In normal use, if I apply NR in this manner, I usually tend to limit Intensity to 25-35% and this works well. Also playing with Sharpening makes a difference. Each situation may call for a unique setting. By default when NR is used, the Intensity is set to 0 .. so no NR is applied until the user sets some! As said, cuts chroma noise significantly, but also kills important details .. bird feather's will definitely come together if used in this heavy handed manner! If detail is not an important quality to maintain, then this is an easy one click solution. A better quality solution exists in the form of noise reduction in an edit step. Create a new edit step and select NR(Toolbar-> Adjust->Noise Reduction) and you will see an edit step such as the top edit step in the next screenshot. Note that two NR edit steps have been applied, but only the Better Option is active on the image(note the unticked first edit step). This is just to indicate what your options are when using NR in this manner. The edit step below this one tho shows the better method for applying this noise reduction. Set the quality to Better Quality and then importantly change the Opacity to the Luminance-Chrominance option!! This is where you can reduce Chroma noise massively(completely) and still maintain good detail levels. Just for giggles I set Intensity up to a massive 75%(normally you would limit this to 35-50%) and vary the Luminance opacity to suit. As you set luminance intensity, you increase the grain appearance in the image which affects how grain and detail is rendered. Chroma is best kept high(ie. close to 100%) as this is what the point is all about .. to remove chroma noise whilst trying to maintain detail. The general NR option in the Camera Settings can't offer this sort of flexibility. It simply tries to do the best it can for the quickest possible workflow. Again the settings I've chosen in this screencap are more for the purpose of highlighting the options available and for the Luminance opacity, I usually maintain levels between 50% and 75% .. depending on the image of course. These are just guidelines .. not strict settings to use. Note in the image that the details in the black wine bottle seal are maintained more accurately. Not just the stitching around the seal, but the shading of the folds and creases are much more accurate in appearance when compared to the Chroma noise laden image .. but there is significantly less colour noise. The speckled grain in the black seal will reduce as you increase opacity in the Luminance channel .. but remember that this also decreases detail level. As always with marginal images like this, there is a level of balance to maintain. AND!..... there is another way to apply NR in this fashion. Instead of using Lum-Chrom for the Opacity mode, you can also use the RGB channel mixer. The advantage of using this method is simply that you can work on a chroma colour specific to an individual problem. For example Chroma noise consists of three colours .. Red Green and Blue. If you have more red chroma noise on an area that is affecting the image, you can choose to eliminate red chroma interference and leave blue and green alone if that helps the image. Note that this is very rare to find in an image, but again the point is that this is an option you have at your disposal if the need arises. Something else to be aware of, is that the green channel is basically the same as the Luminance channel in the Lum-Chrom option above. The more you reduce green noise the more detail is smeared ... just like in the Luminance channel above. 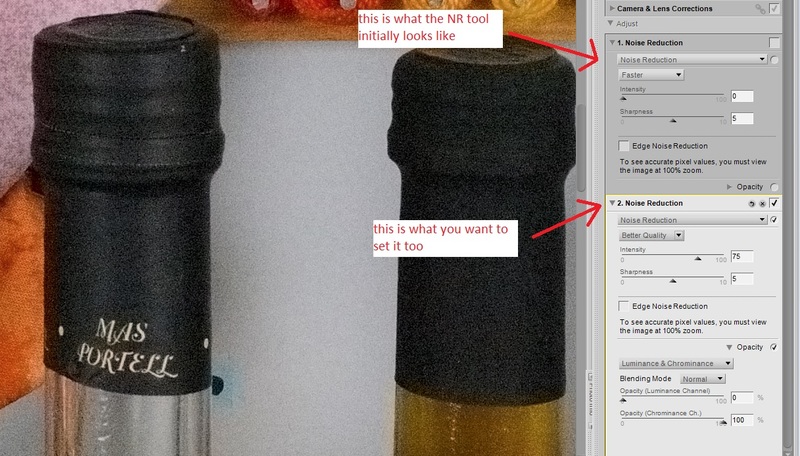 What I've also done here is selectively apply the NR using the brush tool. Note how fine detail is destroyed as NR is applied. So the handiest thing about using the edit step version of NR is that you apply it in a selective manner rather than on the entire image. Clean up the greyscale colours and leave the detail in the colour areas alone. Notice the red cloth in the top left. I applied a small brush stoke to the circled area, and the detail of the leaves in the cloth is gone. I also applied a small patch on the black bottle top on the left and on the entire black bottle seal on the central bottle. The graining on the black seal has been minimised in image 3 because of the settings used, nothing to do with the use of RGB over Luminance-Chrominance for the method. The two opacity modes are the same, they just allow finer tuning for specific needs. What's important here is that you have more options here than just a simple, and sometimes not so effective, noise reduction tool. The different blending modes do nothing for even better NR results. Leave the blending modes as Normal and fine tune with levels of Intensity and Sharpness and then Luminance in the Opacity option .. with Chrominance at a high value(100% is a good start point). As said earlier, all questions, comments and more detailed input are welcomed additions to this tute. Basically this is a setting used to eliminate noisiness or grain along fine edges, that may become jaggied of NR is applied to edge area. Leave it on if you need too, but I don't usually notice any practical advantage in using it. It doesn't affect performance of NR, so if you think you may need it, then use it. The use of it tho is questionable. To see the effect it has CLEARLY, you need to zoom in to at least 200% and enable/disable it. Once you've done this, then back at 100% view the effect is more noticeable too. Is it worth using?? ..... well put it this way .. it doesn't hurt!